HEARTS players have been ordered to improve their discipline by head coach Robbie Neilson. Two red cards and 26 yellows have been issued to the Tynecastle side in 13 games this season, and club management feel those numbers are too high. Neilson has held meetings with his squad in an attempt to address the matter and improve on-field behaviour. He is adamant they should continue competing fiercely in their first season back in the Scottish Premiership. However, he admitted today that they must know where to draw the line. Full-back Callum Paterson and striker Gavin Reilly will miss Sunday’s visit to Dundee United through suspension. 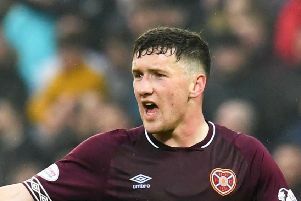 Paterson’s six yellow cards triggered an automatic one-game ban, while Reilly was red-carded for violent conduct in Hearts’ last match against Kilmarnock. Full-back Juwon Oshaniwa sat out two games last month after being ordered off at Inverness. Paterson received a red card at Hamilton in August, but that was reduced to a yellow on appeal. Neilson is now taking steps to ensure his players behave better. “We have a lot of players still getting used to Scottish football and they can take the physicality of it a wee bit far,” he told the Evening News. “The guys who have been sent off, Oshaniwa and Reilly, haven’t played in the top league in this country before. They’re still adjusting to it, it’s a different style of play and these things take time. “We do need to get on top of the discipline because it’s not something we want to continue. We don’t want to have players suspended. It’s not a good image to give to the fans and to the young kids in the academy. It also impacts on the team.